The Budget released by the Federal Government last night has an election flavour to it. 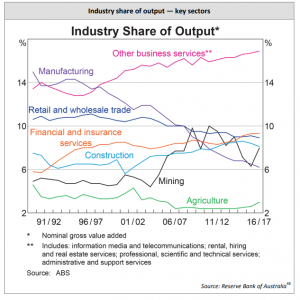 It is industries such as those providing services that continue to provide the largest share of funds to the government coffers, and the next graph shows how dramatically manufacturing has dropped off over the last 30 years. 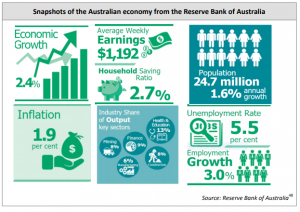 According to the Reserve Bank of Australia, the economy appears to be in a robust state, which is what the government seems to be hanging this budget’s generosity on, particularly when it comes to personal tax reform. 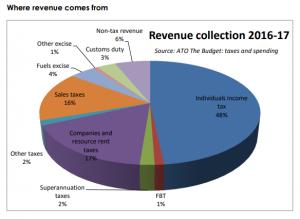 There is a seven-year proposal to adjust personal tax rates. The proposed 0.5% levy to fund the National Disability Insurance Scheme (which was to be added on to the 2% Medicare Levy) has now been scrapped, with the government advising that the NDIS can be funded from current collections. There has been additional funding allocated to the ATO to ensure taxpayers and tax agents are not over-claiming on work-related expenses. This continues to be an increasing audit risk for taxpayers, and it pays to ensure that you know what you are doing when it comes to submitting your income tax return. The $20,000 instant asset write-off available to small business enterprises has been extended for a further twelve months to 30 June 2019. Cash payments over $10,000 must be done via the banking system. This is intended to target the “black economy”. The contractor payment reporting system that was introduced for the construction industry some years ago is being extended to cover the cleaning and courier industries, effective from 1 July 2018. Research and Development (R & D) tax incentives have some major changes occurring. This is a specialised area, and a trap for the unwary. If your organisation is undertaking some R & D, the tax incentives for this can be fantastic, but it is best to speak to us in order to ensure your organisation complies with the strict requirements of this incentive. Single Touch Payroll commences for businesses that have more than 20 employees from 1 July 2018. This will be extended to businesses that have less than 20 employees from 1 July 2019. Your payroll software should be able to do this automatically – if it doesn’t, talk to us – we have got solutions. The 27.5% corporate tax rate for businesses with a turnover of less than $10 million will be extended to businesses with a turnover of less than $50 million. 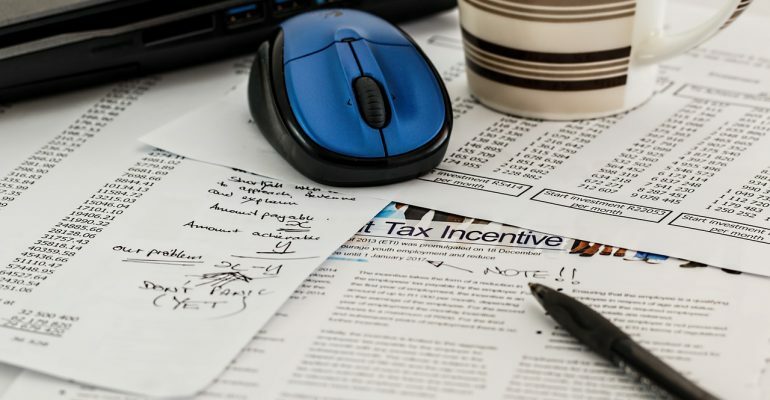 However, this tax rate is only available for companies with active business income – those companies that receive only dividends or rent, or other forms of passive income, still have to pay tax at the 30% corporate tax rate. Self-managed super funds may have up to 6 members, instead of 4. The audit cycle for self-managed super funds is proposed to be extended to 3 years for funds with good compliance records from 1 July 2019. For certain members of superannuation funds with balances less than $6,000, or aged under 25, or where contributions have not been received by the super fund for more than 13 months, there will be a 3% cap on passive fees charged by the super fund. Exit fees will be banned, and insurances (such as life insurance) will become offered on an “opt-in” basis instead of done automatically. The proposed increase of the super guarantee contributions to 12% of employee wages has been deferred until 2025. Super Guarantee will also be due on the gross salary package, rather than net of any salary sacrifice arrangements, putting into law what is common practice by many employers.